DeMarcus Cousins’ highly publicized tweet during last Thursday’s NBA Draft may have been misinterpreted by the sports world. 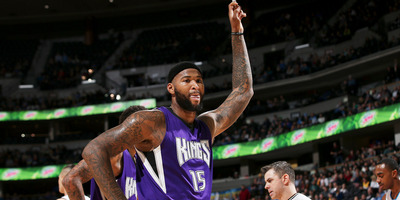 During the first round of the draft, the Sacramento Kings made a puzzling move to trade down from the eighth pick to No. 13, while gaining back some late first-round picks. With the 13th pick, they selected Greek center Georgios Papagiannis, who was not on anyone’s radar as a lottery pick. Cousins, who has a tumultuous relationship with the Kings and is also a center, then tweeted a seemingly pointed message about the pick. It seemed like an obvious message. The Kings, who haven’t made the playoffs since 2006, made a questionable trade for an little-known player to play at the same position as their superstar, plus two other rotation players in Kosta Koufos and Willie Cauley-Stein. It doesn’t exactly seem like they’re moving forward. However, speaking to the media on Monday during a promotional event for the U.S. Men’s Olympic Basketball team, Cousins explained the tweet. According to Cousins, it wasn’t about the Kings or Papagiannis — it was about yoga! Cousins has had his share of blow-ups with the Kings and pointed Twitter messages, so it’s fair to wonder if the Kings made him boil over. But if not, good for Cousins to be practicing yoga, but he does need to work on his timing.